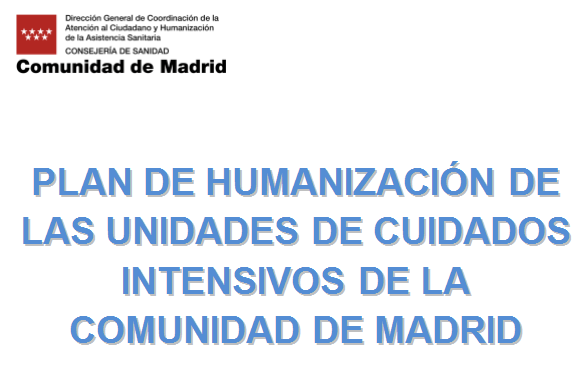 In September 2015, members of the Health Ministry of the Community of Madrid and the IC-HU Project (humanizing intensive care), agreed to the need to develop a plan of humanization of the ICU of Madrid. From the beggining, the Ministry accepted the condition that documents and methods of implementation generated by the Plan were freely available and fully exportable to other communities and other countries. A technical Committee consisting of health professionals (intensivists, nurses, pediatric intensivists, physiotherapists) engaged in activities of humanisation, with members of the Society of Intensive Care of Madrid (SOMIAMA), as well as patients as external experts. This Committee relied on expert reviewers (members of the IC-HU Project), and on the support of members of the General Direction of Coordination of Attention to Citizen and Humanization of Health assistance, and the General Direction of Planning, Research and Training, belonging to the Ministry of health of the Madrid. 4. Presence and participation of families in Intensive Care Units. 8. Care at the end of life. Each strategic line was addressed by a Working Committee, consisting of members of the Committee with the help of external expert when each Commission considered necessary. Each Commission produced a draft according to a common methodology. These drafts consist of: introduction, objectives (General and specific), activities or tasks for their compliance, indicators for evaluation, with well defined categories and references. The documents prepared by the committees were discussed and agreed at meetings of the technical group to prepare a first draft of the paper version. This version will be presented on Monday June 13th at 16 pm, in the Auditorium of Hospital Clínico Universitario San Carlos, to be discussed with all the workers of the ICU of Madrid. Via SOMIAMA, the members will receive an email with your invitation. The draft has been sent to the Heads of ICU, so if you want to consult it prior to the meeting, you just ask for it your boss. Subsequently, the final document of the plan will be presented by the Ministry of health of Madrid. Therefore, we invite you to attend this presentation on Monday, where a survey about the status of humanization of the ICU of Madrid will be also presented. You are all invited, don´t miss it! BRAVO Gabi and everyone involved in creating this plan to establish practical ways to humanize care in ICU ! !